T.J. Bell picked up the 1st last-place finish of his NASCAR Nationwide Series career in Saturday’s Dollar General 300 at the Chicagoland Speedway when his #50 Liberty Tire Recycle / Pinnacle Rubber Mulch Chevrolet fell out with power steering problems after 2 of the race’s 200 laps. The finish, Bell’s first in any of NASCAR’s top three divisions, came in Bell’s 11th Nationwide Series start. Bell, a Truck Series competitor since 2003, has raced in all three of NASCAR’s top divisions this year. He began the 2011 season by making three Truck Series starts for owner Mark Beaver, scoring a season-best finish of 22nd at Darlington. Two months after that finish, Darlington saw Bell make his first Cup Series start, bringing team owner Joe Falk back into the series with assistance from Germain Racing. Since that race, Bell has made three other Cup starts, but has failed to qualify for another eight. At the same time, Bell has also made three Nationwide Series starts. Following a start-and-park effort for Jennifer Jo Cobb at Watkins Glen, Bell and Beaver expanded their truck effort to the Nationwide Series. Following a DNQ at Bristol, Bell put the team into its first race at Atlanta, coming home a respectable 22nd. Bell failed to qualify for both the Cup and Nationwide races at Richmond, then turned his attention to Chicago. Although Bell’s Cup team withdrew from Sunday’s 400-miler, Bell was able to make the Nationwide race by timing in 37th 168.940 mph. He was fast enough to beat seven other “go-or-go-homers,” including Richmond’s last-placer Brian Keselowski in Raymond Key’s #47. Two laps into the race, Bell pulled behind the wall, followed two laps later by J.J. Yeley in the Go Canada Racing #27. Current 2011 LASTCAR leader Jeff Green did not enter the race. 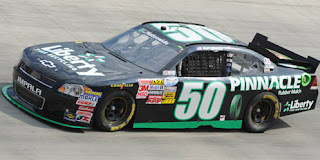 *The #50 has not finished last in a Nationwide race since 2004, when Jennifer Jo Cobb picked up her first last-place finish after her Vassarette Chevrolet was involved in a single-car crash after 2 of the race’s 203 laps. *Bell is the first Nationwide Series driver to ever finish last due to power steering problems. *Bell is the fourth first-time Nationwide last-placer in 2011, joining Kelly Bires (Daytona February), Blake Koch (Dover), and Marc Davis (Nashville July).